Ever heard the expression “just grab the bull by the horns” or “you gotta grab life by the horns”? Well, after two days I finally manned up and grabbed Gertrude by the horns. You see, unlike my sweet leash trained Greta, Gertrude wouldn’t go ANYwhere unless you grabbed her by the horns and drug. So, my husband took her out to pasture every day. I was sick of it though. 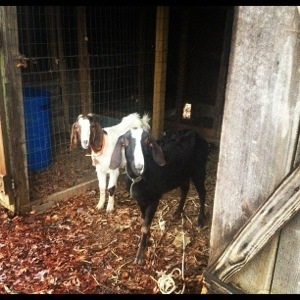 These were my goats, I was going to do this by myself. So, all 123 pounds of me (pure muscle! Ha!) grabbed Gertrude’s horns and pulled all 110 pounds of her down to graze. Wow oh wow. Every muscle in my upper thigh, lower back, and booty hurt so bad the first few days I could barely walk or stand up straight. I think I used more muscles than I ever have in my life, and pulled a few too, dragging her back and forth. Luckily, I only had to do this a few days because the whole family came over and helped me put up an electric fence :). 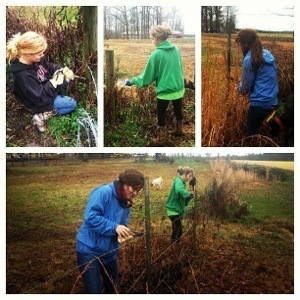 Here are my sweet sisters and I pulling down the old fence. On December 17th Samantha and I were doing some last minute shopping and were just about home when I got a phone call. Remember I told you about my meltdown over being told Gertrude had miscarried? Ha! Justin called because he and Mike were working on the house when he heard a weird noise. Ready to see what he found? Talk about a shocking discovery! No one knew what to say! We rushed home and then called dad, Gertrude is his goat, he told us he wouldn’t be home for a while but Goats know what to do. Ha! Boy was he wrong. 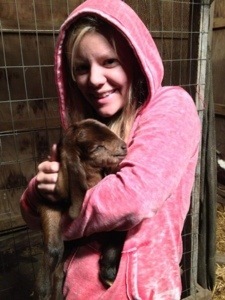 Yes, goats “know what to do” but apparently if this is their first time to kid they aren’t very motherly. Well, this must have been her first time because she certainly lived up to her name. She was a terrible mother (at first). For an hour and a half we held her down to make sure the babies got the colostrum ( It’s in the mothers milk but only for a short time and very very important). 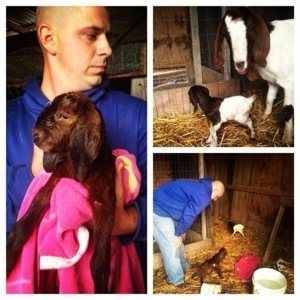 Dr. Benson, our (amazing) local vet, came by when he got off work because at 7:30 (the goats were born around 3) the babies still weren’t getting the hang of drinking from their mom. So, after 30 minutes of Dr. Benson and his boys holding the goats up to Gertrude and literally squirting the milk in their mouths, Dr. Benson said I would need to come out every 2-3 hours that night and continue this process. Seriously?! There’s a reason I don’t have children. I like sleep. Plain and simple. But man if they aren’t cute…. How can anyone say no to a face like this? So their first night was a LONG and COLD night for everyone involved. And no one, including Dr. Benson thought these sweet babies would make it through that first night. However, that was nothing compared to day 2 but that will be another post. I will leave you once again with a few goat facts..and a few extra since I forgot them on the last post. 1. Goats do not, and I repeat, do NOT like the rain. 2. The life span of a goat is about 15 years. All of our goats are 2-5 (excluding the babies), except Greta who is 8. 3. The way you can tell the age of a goat is by their teeth 😀 haha. 4. Before coins, goats were traded for silver because they were so valuable. 5. Supposedly, an ancient Egyptian Pharaoh was buried with 2,000 goats! 6. Both male and female goats can have horns AND beards. Gertrude has horns and one of our new goats has a beard! 7. All herds have a “queen” Gertrude was the queen until our new goats. I will tell you all about the new queen in a later post!